This entry was posted on October 29, 2012 at 6:53 pm and is filed under Action, Drama, thriller with tags 1994. You can follow any responses to this entry through the RSS 2.0 feed. You can leave a response, or trackback from your own site. Excellent indeed Fogs! Totally agree on the sequel as well. Apparently theres some legal entanglements as to who owns the rights though. Besson left the studio that produced this and they hold onto any possible sequel happening. It may never happen for that matter. Great review. I totally agree with your review. Both Portman and Oldman were awesome! Cheers Mithil. All three were great but If I really had to choose, I’d choose Oldman. Excellent on-edge stuff. Excellent work here Mark!! Thanks again for the push to do this!! Good stuff!! “La Femme Nikita” proved Europe could do a modern action/crime drama and do it better than the US cause the American version sucked big time. Reno was so incredible as the “cleaner”, Besson had to give him his own feature. I’m glad he did. 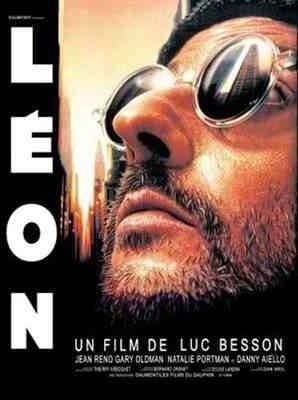 I don’t know if I’d describe the film as “beautiful”, I was too wrapped up in the action and suspence, but “Leon” is a classic! Nikita was an excellent film indeed Ray. I didn’t hate the remake but it certainly wasn’t as good. Totally agree on Reno’s “cleaner” in that film too. Very memorable. He’s great in this as well. I know “beautiful” may not be a word that you’d expect to hear about this but I really thought so. Every scene was framed wonderfully and he managed to find art and beauty in scenes of grime and violence. Besson excels himself here. I meant to mention in my review that it was the extended version I watched recently. It has an extra 20mins or so. There are some interesting scenes but they affect the flow on the original cut. You mentioned you liked Gary Oldman in this. The same year he did Leon, he did “Romeo is Bleeding”, my favorite Oldman role. Check it out if you haven’t yet. Same action/crime genre. I’ve seen Romeo is Bleeding Ray. It was a long time ago but I loved it as well. (I was originally drawn to because of it’s title that shares it’s name with one of my favourite Tom Waits songs). Oldman was on a roll around this time. My favourite of his would be Drexl from True Romance though. He steals that film from under the noses of a very fine cast. When are you going to review a bad movie!? Another fantastic choice Mark. Cheers Andy. It’s certainly a great film and seems to have many, many fans. Rightfully so! Oldman also certainly stands as one of cinema’s great bad guys here. I wish he’d take on more roles like this again. During the 90’s Oldman was on fire! A mighty good film. Reno and Portman are quite good but its Oldman’s detestable scumbag that steals the show! You have me wanted to rewatch it! Good stuff Mark! A mighty good indeed bro. It was great to see it myself again as well. Agreed on Oldman. Such a great villain and I remember you recently including him in a post yourself. Great post, Portman exudes such intensity for someone so young in the film. Agreed Vinnie. I loved Portman in Black Swan but I still rate this her best yet. Thanks man. Great review Mark, big fan of this film. Not a bad film for Portman to make her debut in and, as many have already said, Oldman is great in this. Great review! I love this film, great performances all around but yeah, Oldman is just so perfectly creepy as the pill-popping corrupt cop. I do like the unlikely friendship between Portman and Reno’s characters, I’d think this is one of the best roles for both actors. Thanks Ruth. Yeah, it’s a fantastic film and it’s definitely the best roles Reno and Portman have had. Arguably it’s also Oldman’s. I prefer him in True Romance but it’s a close call. Great review, Mark. I love this film. One of my favorites. “…are marvellous as the unlikely pairing but while they share some genuinely heartfelt moments, the boundaries are blurred with an uncomfortable, sexual subtext between them”. I agree. It’s kinda off-putting. And, like you, I didn’t think Oldman overacted. I think the nature of the character was very over-the-top. Thanks Fernando! Yeah, it was the uncomfortable subtext that stopped me from giving it top marks. I couldn’t quite shake it off. As for Oldman, I totally agree. His character completely required to be played in such a way and Oldman excelled. Thanks man. I still maintain it’s Portman’s best performance and Oldman was such a joy to watch. If only Oldman could get another role like this again soon. I think I have to agree as she was able to show a whole range of emotions in this movie. My favorite though remains Black Swan (but that’s because I love that movie). Oldman has had so many interesting roles, but would love to see him again in something like this. Black Swan’s a superb movie as well and Portman thoroughly deserved the Oscar that year but like you say, it’s her range here that I find most impressive. That and the fact that she was still young and relatively inexperienced. I actually prefer the original cut, The Professional, to the extended cut or the international version, Léon: The Professional. The extended cut adds 25 minutes to the movie. Besson was never forced to cut the 25 minutes and was completely happy with the original cut. He removed some of the more sexually akward situations when he found that the audience was giggling at those moments ruining the tone for him. Also it should be known that Besson married and had a daughter with a 16 year old French actress raising a few eyebrows at the movie’s underage sexual tension. She was in Leon and later went on to star in the horror thriller Haute Tension. The famous “bring EVERYONE!” scene can be found all over You Tube. LOL. All that being said I really liked the film. Portman was great. Even better in Ted Demme’s little seen Beautiful Girls which came next. Reno really excelled at his role as “the cleaner” as he’s played similar roles in Nakita, The Professional, Mission: Impossible and Ronin. The action scenes were straight out of a Hong Kong action flick. It never would have been made in America and it’s probably for the best. Totally agree in the cut Dave. This was the extended cut I watched recently. There were some nice additions like burning the dealers drugs and some extra training bits but overall I prefered the original as well. It flowed better and what Besson omitted, the film didn’t miss. Didn’t know that about him marrying a 16 year old. That does add an extra bit to the film. It was this uncomfortable subtext that didn’t sit well with me. That being said it’s still a great flick. I understand your opinion on Oldman and many would agree but I just lapped up his performance. I remember the first time I seen the film and genuinely didn’t know what his character might do next. Thanks as always Dave.